A 6-hour guide on how to identify and profit from the hottest stocks that spike 100-500% within a few days, weeks and months. For the first time, Timothy Sykes reveals his time-tested formula for finding the stock market's biggest winners which have helped him become a multi-millionaire. 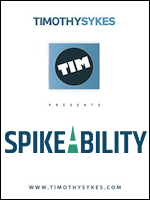 Using dozens of past examples, Timothy outlines his "Spikeability" formula and shares his 15-point criteria for finding the best stocks in the entire stock market, which he previously has referred to as Supernovas.